To promote increased overall PVRC Sweepstakes participation by rewarding the PVRC Chapters that show the most improvement from the prior year. · Chapter Trophy for Score Improvement: Will go to the single PVRC chapter that improves their Sweepstakes score from the prior year by the highest %. · Chapter Trophy for Member Mobilization: Will go to the single PVRC chapter that adds the most net-new Sweepstakes participants from the prior year. · Battle of the Potomac: the chapters are divided by the Potomac river, with all chapters going into either North or South. The side of the Potomac that adds the most Sweepstakes points over their prior year total scores wins the bragging rights, they win the “Battle of the Potomac”. Upon the announcement of the awards, the PVRC President or President’s designee will attend a chapter meeting of each of the winning chapters and present each Chapter Chairperson with the coveted Chapter Trophy. The trophies will have the chapter name and year earned engraved upon them. The Chapter Chairpersons will then determine how to share their trophy for the coming year; they are encouraged to bring the cup to chapter meetings throughout the year and let contributing chapter members take the cup home between meetings. When the next Sweepstakes is competed in November, the two trophies will be returned to the PVRC President for safekeeping until the next year’s winning chapters are determined. Awards will be based on the combined CW and SSB Sweepstakes scores and participation found in the PVRC 5M Program as posted at PVRC.org. Scores will be the claimed Sweepstakes scores and participation will be as indicated by chapter affiliation in the 5M scores. - When submitting Sweepstakes logs to the ARRL, ensure PVRC is credited as the club. - Check to ensure that in turn, the 5M program captures your score. - Make sure your chapter affiliation is noted properly in the PVRC roster. For most PVRC members, this should require no extra work besides getting their Sweepstakes log into ARRL. Chapter affiliation is optional for all PVRC members, though most (>90%) members have a chapter affiliation. 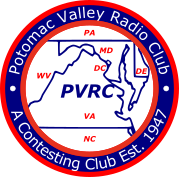 If a member is not affiliated with a chapter, their Sweepstakes score will not help (or hurt) any Chapter for these awards, but DOES help PVRC in the Sweepstakes club competition provided by ARRL. In accordance with PVRC bylaws, a member may change chapter affiliation at any time. Once the winning chapters are determined each year, the scores and participant numbers will be locked and become the basis for the next year’s awards. So switching to a different chapter mid-year will help the new chapter in the next Sweepstakes but not impact the old chapter’s past results. Chapter changing solely for the sake of this award (without actual QTH movement) is discouraged and may be disallowed at the sole discretion of the judges. Chapter Points are counted by the unique reported scores as shown in the 5M results by chapter. For Sweepstakes, scores as submitted will be counted once per log submitted. In this case, the score for the chapter (for the SSB leg) will be 157,200. The W3AAA score will count once, and the [email protected] score counts. The second version of the 150,200 points is not eligible and therefore not included. A chapter’s eligible 5M scores of the SSB and CW legs will be added to provide the chapter’s scoring total for the current year. This is then compared to the chapter’s scoring total from the prior year, and the percentage increase is what is used for that chapter in determining the Scoring Improvement award. In this example, if a 22.40% total score increase is higher than any other chapter, then Mt. Airy would win the Score Improvement award and trophy. Participation is counted by the unique lines as shown in the 5M results by chapter. So a single participant could be counted multiple times as they participate in different log entries. In this case, the participation total for the Mt. Airy chapter will be “3”, as being a host (and Elmering and such, as with W3AAA here) is valued, as are “HMOs” – highly motivated operators that may enter a Sweepstakes leg twice from two different stations (as with W3MMM here). A chapter’s participation scores of the SSB and CW legs will be added to provide the chapter’s participation total for the current year. This is then compared to the chapter’s participation total from the prior year, and the “net new” participation is the number used for that chapter in determining the Membership Mobilization award. In this example, if 2 new participants is higher than any other chapter, then Mt. Airy would win the Membership Mobilization award and trophy. When calculating the total chapter scores, it is possible to have a tie among chapters. This is particularly true for the Member Mobilization award. When a tie occurs, the chapter with the highest score in the other trophy category will win. In this example, the Laurey Caverns chapter wins the Score Improvement trophy, and the Lake Gaston chapter wins the Member Mobilization trophy. Certain years may result in all chapters experiencing a decline in scores and/or participation numbers. When this happens, the Chapter with the least amount of decline will be with winner. It is possible for a chapter to win both trophies in one year. This has not happened in our historical analysis. If it did – bravo to that winning chapter! Both trophies will be theirs for the coming year. The judge(s) for this program will release the chapter reference scores (prior year scores) each year at least two months before the first Sweepstakes weekend. That will give the chapter chairs their targets and allow them to strategize on what improvements might win them a trophy in the coming year. The 5M scores and participation as recorded in the 5M program will be the scores of record for this chapter competition. It is understood that final scores may change; this will not change the 5M scores or the calculations for these trophies. If, however, a member’s log is disqualified from Sweepstakes, and the trophies have not been awarded, the judge(s) may, at their sole discretion, remove that member’s data from the chapter score calculations. Once the trophies have been awarded, they remain awarded and future disqualifications or other new information about individual members will not reverse the award. Organized chapter cheating, should that ever happen, might result in a trophy reversal at the judge(s) sole discretion.